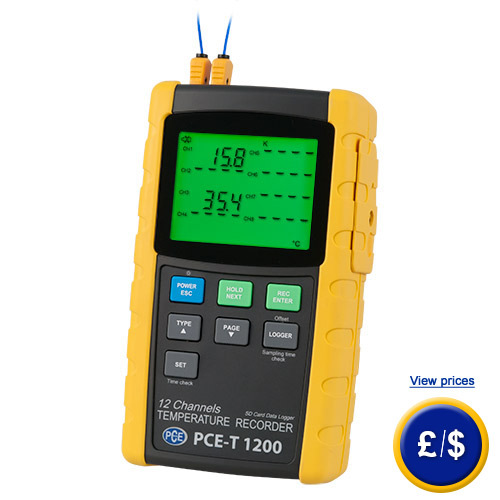 The 12-channel temperature recorder PCE-T 1200 features a 2 GB memory SD card (SD cards can have a maximum of 16 GB data space). The data saved on the SD memory card can be read via Excel on a computer. The interval for the data logging is eligible starting from 1 second per channel up to a maximum of 3600 seconds. The 4.5 " display featuring green background lights can indicate the values of a maximum of eight channels simultaneously (CH 1 ... CH 8). In order to view the measurement data of channel 9 to channel 12, pressing a single key is enough. Thus the evaluation of the recorded data becomes very comfortable, in order to maintain an overview for the complete system ( if all twelve channels are occupied by sensors). 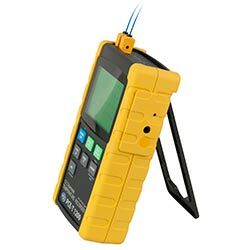 There are six different sensor types (K, J, T, E, R, S) that can be connected to the 12-channel temperature recorder. If there are any questions about this 12- channel temperature recorder PCE-T 1200 please have a look at the technical specification below or call: UK customers +44(0) 23 809 870 30 / US customers +1-410-387-7703. Our technicians and engineers will gladly advise you regarding all data recorders and all products in the field of measuring instruments, regulation and control and scales. 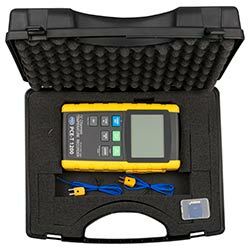 For customers, who want to admit the temperature recorder to their internal pool of test equipment. The calibration procedure includes laboratory calibration process and ISO certification. The customer's name and address are included. These certificates are comparable to NIST and UKAS certificates. They are accepted all over the world.